EVELYNE Geber knows her husband John's not the sort of bloke to do things by halves. So when he was on a business trip to the Barossa Valley in 1998 and rang their Sydney home to say he'd just put down an option to buy the derelict remains of what was once Australia's grandest chateau, she was not all that surprised. "My first reaction was 'Wow, how many bedrooms has it got?'" she says of the call, in which John asked her to jump on a plane and come down for an inspection before he handed over a cheque. Today, ten years and somewhere in the vicinity of $8m later, their Chateau Tanunda has been restored to the spectacle of its winemaking heyday of over a century ago, complete with a Grand Ballroom for entertaining near-on 500 guests, a croquet court and a sunken garden, and a cellar big enough to hold five million litres of wine in the event of dehydration. And for cricket-tragic John, a full size oval to which he annually invites some of the biggest names in the world game for something that's a bit more than your average backyard stuff. John Geber is a marketing whiz who made a name flogging the virtues of English round teabags and Danish sugar-free gum in Australia, before venturing very successfully into marketing our wines overseas. 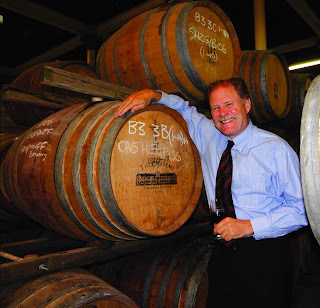 It was on wine business in the Barossa in 1998 that he came upon Chateau Tanunda. "Derelict as it was, I was blown away by it," he recalls. "There was a 'Do Not Enter' sign so I rang a friend to ask about it; and he told me it was for sale, although there'd been no interest in it for five or six years." And the first person he spoke with at the owner's headquarters thought he was a nutter, but within 24 hours John had signed up to buy what he discovered was not only one of Australia's most iconic chateaus, but an important part of our history as well. "The Chateau had been the core of a kind of co-operative to export Australian wine to Europe where vineyards had been wiped-out by phylloxera in the late1800s," John says. "Around 560 mainly-immigrant growers in the Barossa supplied grapes exclusively to the Chateau, being paid a-then enormous one-pound a gallon for the juice of their crops… enough for many to pay off their farms in just a few years." When it opened in 1890 the Bavarian-style Chateau Tanunda was the biggest building in South Australia and the largest winery in the Southern Hemisphere; bricks were made on-site and bluestone brought in from a nearby quarry to construct cellar walls a-near metre thick for the 2-storey, 3500 sq metre winery and its 21 metre high tower. Its last owners before John Geber stripped and abandoned it in the early 1990s and tragically, John says, dumped everything including the original architectural plans and records of the first owners and co-operative members. He slept on the floor for the first three months because the chateau had never actually been a residence, and discovered it really was haunted by ghosts of suppliers and members past. "I had some interesting nights!" he says. John's idea in restoring the Chateau to its former winemaking glory was to make it a winery first, and a tourist attraction second. "We found ballast from ships of the 1800's at a local abattoir and used that to cobblestone around the Chateau … and 27,000 tonnes of brick and concrete we'd demolished was used to level-up a sloping site for our cricket oval. "The oval cost $200,000 but we saved three times that in not carting the rubble away and dumping it." Today an annual Masters Charity Cricket Match between an Australian Invitational Team and each year's visiting nation is played on the oval – this year it'll be against the West Indies in November. John Geber has achieved his dream of re-creating one of Australia's greatest wineries and chateau, but says he still has much to achieve. "I'm not a get-in and get-out person; I'm here for the long haul." 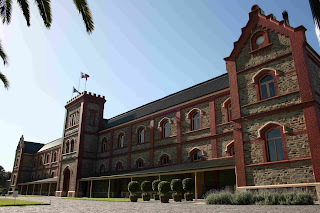 FORMER glory: the restored Chateau Tanunda. THE Chateau's Cricket Ground rises from the rubble. Inset: Chateau Tanunda early last century.